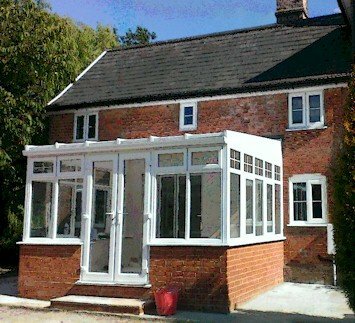 The lean-to conservatory is the cheapest conservatory option and the easiest to erect, simple frames and a roof kit make this the best value for money conservatory. Price includes frames to go on 600mm high dwarf walls with clear double glazed units and a set of french doors to go in one side or the front. There is also an option to upgrade the french doors to a set of sliding patio doors or bi-fold doors. Optional opening windows can be added to the conservatory and placed anywhere specified. The roof is made using a Synseal synergy bar system, one of the best currently on the market and a much superior system to other cheaper systems currently available. The roof will come with 25mm poly as standard with the option to upgrade to glass. Prices exclude brickwork, internal cills and flashings. DIY Lean-To 3m x 3m Conservatory on Dwarf Walls - Best Price Online! Lean-to Conservatory on Dwarf Walls Buy direct from a conservatory manufacturer, French doors as standard or a choice to upgrade to a set of sliding patio doors or Modlok Bi-fold doors. Made to measure and any designs to suit your needs. 3000mm wide x 3000mm projection Lean-to conservatory. A ..
DIY Lean-To 3m x 3.5m Conservatory on Dwarf Walls - Best Price Online! Lean-to Conservatory on Dwarf Walls Buy direct from a conservatory manufacturer, French doors as standard or a choice to upgrade to a set of sliding patio doors or Modlok Bi-fold doors. Made to measure and any designs to suit your needs. 3000mm wide x 3500mm projection Lean-to conservatory. A ..
DIY Lean-To 3m x 4m Conservatory on Dwarf Walls - Best Price Online! Lean-to Conservatory on Dwarf Walls Buy direct from a conservatory manufacturer, French doors as standard or a choice to upgrade to a set of sliding patio doors or Modlok Bi-fold doors. Made to measure and any designs to suit your needs. 3000mm wide x 4000mm projection Lean-to conservatory. ..
DIY Lean-To 3m x 4.5m Conservatory on Dwarf Walls - Best Price Online! Lean-to Conservatory on Dwarf Walls Buy direct from a conservatory manufacturer, French doors as standard or a choice to upgrade to a set of sliding patio doors or Modlok Bi-fold doors. Made to measure and any designs to suit your needs. 3500mm wide x 4500mm projection Lean-to conservatory. ..
DIY Lean-To 3m x 5m Conservatory on Dwarf Walls - Best Price Online! Lean-to Conservatory on Dwarf Walls Buy direct from a conservatory manufacturer, French doors as standard or a choice to upgrade to a set of sliding patio doors or Modlok Bi-fold doors. Made to measure and any designs to suit your needs. 3000mm wide x 5000mm projection Lean-to conservatory. ..
DIY Lean-To 3m x 6m Conservatory on Dwarf Walls - Best Price Online! Lean-to Conservatory on Dwarf Walls Buy direct from a conservatory manufacturer, French doors as standard or a choice to upgrade to a set of sliding patio doors or Modlok Bi-fold doors. Made to measure and any designs to suit your needs. 3000mm wide x 6000mm projection Lean-to conservatory. ..
DIY Lean-To 3m x 7m Conservatory on Dwarf Walls - Best Price Online! Lean-to Conservatory on Dwarf Walls Buy direct from a conservatory manufacturer, French doors as standard or a choice to upgrade to a set of sliding patio doors or Modlok Bi-fold doors. Made to measure and any designs to suit your needs. 3000mm wide x 7000mm projection Lean-to conservatory. ..
DIY Lean-To 3m x 8m Conservatory on Dwarf Walls - Best Price Online! Lean-to Conservatory on Dwarf Walls Buy direct from a conservatory manufacturer, French doors as standard or a choice to upgrade to a set of sliding patio doors or Modlok Bi-fold doors. Made to measure and any designs to suit your needs. 3000mm wide x 8000mm projection Lean-to conservatory. ..
DIY Lean-To 3m x 10m Conservatory on Dwarf Walls - Best Price Online! DIY Lean-To 3.5m x 3m Conservatory on Dwarf Walls - Best Price Online! Lean-to Conservatory on Dwarf Walls Buy direct from a conservatory manufacturer, French doors as standard or a choice to upgrade to a set of sliding patio doors or Modlok Bi-fold doors. Made to measure and any designs to suit your needs. 3500mm wide x 3000mm projection Lean-to conservatory. ..
DIY Lean-To 3.5m x 3.5m Conservatory on Dwarf Walls - Best Price Online ! Lean-to Conservatory on Dwarf Walls Buy direct from a conservatory manufacturer, French doors as standard or a choice to upgrade to a set of sliding patio doors or Modlok Bi-fold doors. Made to measure and any designs to suit your needs. 3500mm wide x 3500mm projection Lean-to conservatory. A ..
DIY Lean-To 3.5m x 4m Conservatory on Dwarf Walls - Best Price Online! Lean-to Conservatory on Dwarf Walls Buy direct from a conservatory manufacturer, French doors as standard or a choice to upgrade to a set of sliding patio doors or Modlok Bi-fold doors. Made to measure and any designs to suit your needs. 3500mm wide x 4000mm projection Lean-to conservatory. ..
DIY Lean-To 3.5m x 4.5m Conservatory on Dwarf Walls - Best Price Online! DIY Lean-To 3.5m x 5m Conservatory on Dwarf Walls - Best Price Online! Lean-to Conservatory on Dwarf Walls Buy direct from a conservatory manufacturer, French doors as standard or a choice to upgrade to a set of sliding patio doors or Modlok Bi-fold doors. Made to measure and any designs to suit your needs. 3500mm wide x 5000mm projection Lean-to conservatory. ..
DIY Lean-To 3.5m x 6m Conservatory on Dwarf Walls - Best Price Online! Lean-to Conservatory on Dwarf Walls Buy direct from a conservatory manufacturer, French doors as standard or a choice to upgrade to a set of sliding patio doors or Modlok Bi-fold doors. Made to measure and any designs to suit your needs. 3500mm wide x 6000mm projection Lean-to conservatory. ..
DIY Lean-To 3.5m x 8m Conservatory on Dwarf Walls - Best Price Online! Lean-to Conservatory on Dwarf Walls Buy direct from a conservatory manufacturer, French doors as standard or a choice to upgrade to a set of sliding patio doors or Modlok Bi-fold doors. Made to measure and any designs to suit your needs. 3500mm wide x 8000mm projection Lean-to conservatory. ..
DIY Lean-To 3.5m x 10m Conservatory on Dwarf Walls - Best Price Online! Lean-to Conservatory on Dwarf Walls Buy direct from a conservatory manufacturer, French doors as standard or a choice to upgrade to a set of sliding patio doors or Modlok Bi-fold doors. Made to measure and any designs to suit your needs. 3500mm wide x 10000mm projection Lean-to conservatory. A..
DIY Lean-To 4m x 3m Conservatory on Dwarf Walls - Best Price Online! Attention! This is a made to measure product and it is non-refundable from the point of confirmation. Lean-to Conservatory on Dwarf Walls Buy direct from a conservatory manufacturer, French doors as standard or a choice to upgrade to a set of sliding patio doors or Modlok Bi-fold doors. Made t..
DIY Lean-To 4m x 3.5m Conservatory on Dwarf Walls - Best Price Online! DIY Lean-To 4m x 4m Conservatory on Dwarf Walls - Best Price Online! DIY Lean-To 4m x 4.5m Conservatory on Dwarf Walls - Best Price Online! DIY Lean-To 4m x 5m Conservatory on Dwarf Walls - Best Price Online! DIY Lean-To 4m x 6m Conservatory on Dwarf Walls - Best Price Online! DIY Lean-To 4m x 8m Conservatory on Dwarf Walls - Best Price Online! DIY Lean-To 4m x 10m Conservatory on Dwarf Walls - Best Price Online! DIY Lean-To 4.5m x 3m Conservatory on Dwarf Walls - Best Price Online! Lean-to Conservatory on Dwarf Walls Buy direct from a conservatory manufacturer, French doors as standard or a choice to upgrade to a set of sliding patio doors or Modlok Bi-fold doors. Made to measure and any designs to suit your needs. 4500mm wide x 3000mm projection Lean-to conservatory. ..
DIY Lean-To 4.5.m x 3.5m Conservatory on Dwarf Walls - Best Price Online! Lean-to Conservatory on Dwarf Walls Buy direct from a conservatory manufacturer, French doors as standard or a choice to upgrade to a set of sliding patio doors or Modlok Bi-fold doors. Made to measure and any designs to suit your needs. 4500mm wide x 3500mm projection Lean-to conservatory. ..
DIY Lean-To 4.5m x 4m Conservatory on Dwarf Walls - Best Price Online! Lean-to Conservatory on Dwarf Walls Buy direct from a conservatory manufacturer, French doors as standard or a choice to upgrade to a set of sliding patio doors or Modlok Bi-fold doors. Made to measure and any designs to suit your needs. 4500mm wide x 4000mm projection Lean-to conservatory. ..
DIY Lean-To 4.5m x 4.5m Conservatory on Dwarf Walls - Best Price Online! Lean-to Conservatory on Dwarf Walls Buy direct from a conservatory manufacturer, French doors as standard or a choice to upgrade to a set of sliding patio doors or Modlok Bi-fold doors. Made to measure and any designs to suit your needs. 4500mm wide x 4500mm projection Lean-to conservatory. ..
DIY Lean-To 4.5m x 5m Conservatory on Dwarf Walls - Best Price Online! Lean-to Conservatory on Dwarf Walls Buy direct from a conservatory manufacturer, French doors as standard or a choice to upgrade to a set of sliding patio doors or Modlok Bi-fold doors. Made to measure and any designs to suit your needs. 4500mm wide x 5000mm projection Lean-to conservatory. ..
DIY Lean-To 4.5m x 6m Conservatory on Dwarf Walls - Best Price Online! Lean-to Conservatory on Dwarf Walls Buy direct from a conservatory manufacturer, French doors as standard or a choice to upgrade to a set of sliding patio doors or Modlok Bi-fold doors. Made to measure and any designs to suit your needs. 4500mm wide x 6000mm projection Lean-to conservatory. ..
DIY Lean-To 4.5m x 8m Conservatory on Dwarf Walls - Best Price Online! Lean-to Conservatory on Dwarf Walls Buy direct from a conservatory manufacturer, French doors as standard or a choice to upgrade to a set of sliding patio doors or Modlok Bi-fold doors. Made to measure and any designs to suit your needs. 4500mm wide x 8000mm projection Lean-to conservatory. ..
DIY Lean-To 4.5m x 10m Conservatory on Dwarf Walls - Best Price Online! DIY Lean-To 5m x 3m Conservatory on Dwarf Walls - Best Price Online! DIY Lean-To 5m x 3.5m Conservatory on Dwarf Walls - Best Price Online! DIY Lean-To 5m x 4m Conservatory on Dwarf Walls - Best Price Online! DIY Lean-To 5m x 4.5m Conservatory on Dwarf Walls - Best Price Online! DIY Lean-To 5m x 5m Conservatory on Dwarf Walls - Best Price Online! Attention! This is a made to measure product and it is non-refundable from the point of confirmation. Lean-to Conservatory on Dwarf Walls Buy direct from a conservatory manufacturer, French doors as standard or a choice to upgrade to a set of sliding patio doors or Modlok Bi-fold doors. M..
DIY Lean-To 5m x 6m Conservatory on Dwarf Walls - Best Price Online! DIY Lean-To 5m x 8m Conservatory on Dwarf Walls - Best Price Online!